Case IH In-line Rippers are versatile primary tillage tools designed to limit compaction and control moisture for enhanced soil conditions that promote high yields. Effective for both conventional and no-till or conservation tillage practices, we have options to fit your operation. Case IH in-line rippers promote early germination and plant emergence — critical factors in achieving maximum yields. Case IH in-line rippers help remove variation in no-till soil conditions. Limit topsoil losses and manage moisture more efficiently by using Case IH in-line rippers. Case IH in-line rippers with root zone banding place nutrients in the root zone where those nutrients are available for roots when plants need them most. Nutrient runoff during periods of heavy rain is reduced by Case IH in-line rippers. By placing fertilizer in the root zone, roots are allowed to take up more food for a longer period of time. 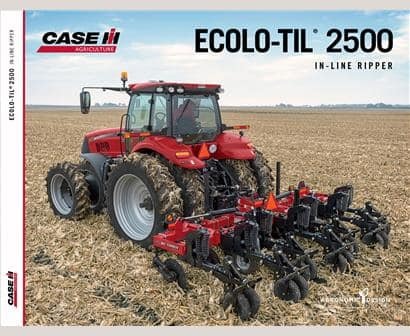 Count on Case IH in-line rippers to promote healthy soil tilth — soil better able to absorb and hold water for plant growth. In low-moisture conditions, healthy soil can mean the difference between healthy plants and drought stress.